Restore and revitalize the dull, sagging neck skin and aging skin complexion on the décolleté; and restore the V Zone’s youthful tautness and elasticity, getting back that youthful, vibrant glow and appearance. Diminish and calm the look of hyperpigmentation and age spots while creating taut, elastic and younger looking skin on your neck and décolleté. Condition the skin, leaving it soft, silky and taut. Helps diminish the laxity found in the V-Zone of the skin. This serum will not leave the skin with a greasy feeling nor will it clog pores. Help with the appearance of sagging skin and laxity in the neck area. Even out texture and tone of the neck and décolleté. The “V-ZONE” area of your skin starts at the bottom of your chin and winds down to your cleavage. Many people can experience dry, thin and sagging skin with signs of wrinkling, poor skin quality and dull complexion. 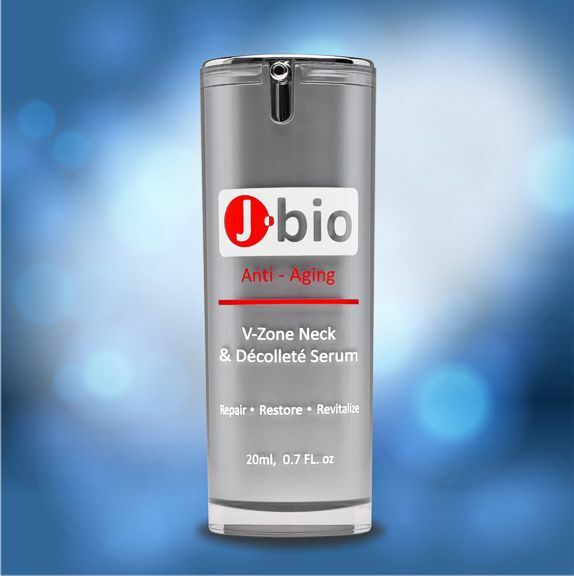 J•bio™ V-Zone Neck and Décolleté Serum with Proprietary ICG 9-Triplex™ can help you with these skin issues, preventing your skin from being dry, lax, saggy and dull. 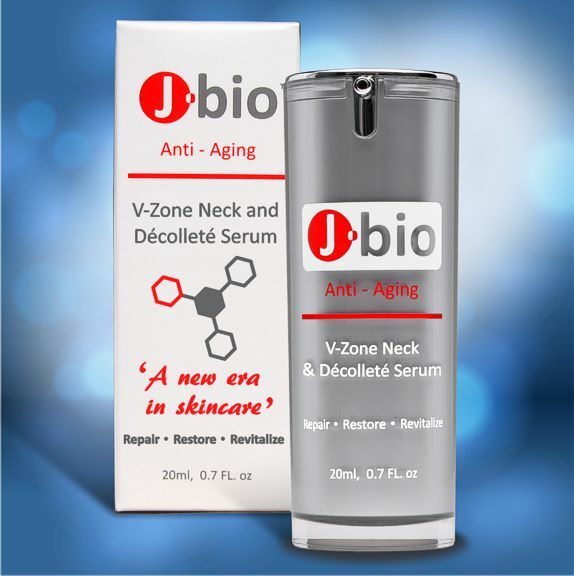 J•bio™ V-Zone Neck and Décolleté Serum has been formulated for the essential purpose of keeping your skin’s neck and décolleté healthy and intact, while helping you to maintain a youthful appearance. This concentrated formula is made with specific and specialized human growth factors that help diminish and calm the look of hyperpigmentation, encouraging collagen and elastin production – creating taut, elastic and younger looking skin. This moisturizing formula helps support the health of skin, maintains lasting results, and is nonirritating even to sensitive skin types. This pure, non-greasy formula has a clean scent and will not clog pores.